Located in a strategic position, Hotel Stromboli Rome is the ideal accommodation from which to explore this glorious city. For business or pleasure our cosy Roma Stromboli is perfectly situated to offer our guests easy access to all the wonders and delights of the Eternal City. Our central location ensures that arriving from any other point in Italy or arriving and departing from the airport is effortless, as we are only 100m from Termini Railway Station. Reaching all areas of the city is a breeze as we are situated next to both underground lines, various bus routes heading in all directions of the city and taxi ranks. Consult our Interactive Map of Rome for a more precise idea of our position. Our interactive map also includes satellite photos giving you an aerial view of the hotel’s surroundings. Take off on foot from Stromboli Roma and you will experience sensory overload with all the delights on offer. A few minutes away is the Colosseum where up to 80,000 spectators would regularly watch wild beasts slaughtered by brave gladiators. Nearby is the Roman Forum which was the commercial, political and religious centre of ancient Rome, built over a period of 900 years and is still dotted with monuments and temples. 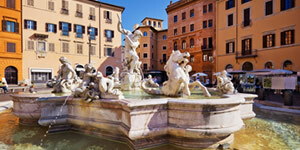 No trip to Rome is complete without visiting the world famous Spanish Steps or without throwing some coins into the Trevi Fountain. A short metro ride away is St. Peter’s and the Vatican Museums. As well as amazing monuments in the immediate vicinity are an incredible array of shops, restaurants and nightlife. 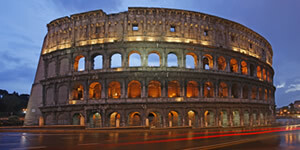 From the highway take the Grande Raccordo Anulare, follow the directions to Roma Centro and then to Stazione Termini. 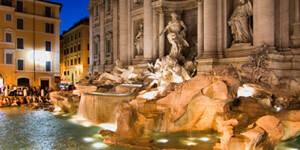 Roma Termini Railway Station is approximately 100 metres from Hotel Stromboli. A taxi costs 40euros from Fiumicino and 30 from Ciampino Airports. An express train leaves Fiumicino every thirty minutes to Termini and from Ciampino a shuttle bus directly to Termini. Please feel free to print of the Map to help you. Our address is Via Marsala 34.